African trypanosomiasis or sleeping sickness is a parasitic disease of humans and other animals. 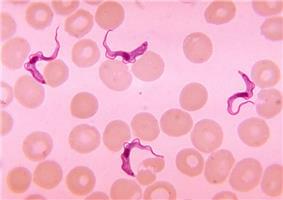 It is caused by protozoa of the species Trypanosoma brucei. There are two types that infect humans, Trypanosoma brucei gambiense (T.b.g) and Trypanosoma brucei rhodesiense (T.b.r.). T.b.g causes over 98% of reported cases. Both are usually transmitted by the bite of an infected tsetse fly and are most common in rural areas. Initially, in the first stage of the disease, there are fevers, headaches, itchiness, and joint pains. This begins one to three weeks after the bite. Weeks to months later the second stage begins with confusion, poor coordination, numbness and trouble sleeping. Diagnosis is via finding the parasite in a blood smear or in the fluid of a lymph node. A lumbar puncture is often needed to tell the difference between first and second stage disease. Prevention of severe disease involves screening the population at risk with blood tests for T.b.g. Treatment is easier when the disease is detected early and before neurological symptoms occur. Treatment of the first stage is with the medications pentamidine or suramin. Treatment of the second stage involves: eflornithine or a combination of nifurtimox and eflornithine for T.b.g. While melarsoprol works for both it is typically only used for T.b.r. due to serious side effects. The disease occurs regularly in some regions of sub-Saharan Africa with the population at risk being about 70 million in 36 countries. As of 2010 it caused around 9,000 deaths per year, down from 34,000 in 1990. An estimated 30,000 people are currently infected with 7000 new infections in 2012. More than 80% of these cases are in the Democratic Republic of the Congo. Three major outbreaks have occurred in recent history: one from 1896 to 1906 primarily in Uganda and the Congo Basin and two in 1920 and 1970 in several African countries. Other animals, such as cows, may carry the disease and become infected. African trypanosomiasis symptoms occur in two stages. The first stage, known as the haemolymphatic phase, is characterized by fever, headaches, joint pains, and itching. Fever is intermittent, with attacks lasting from a day to a week, separated by intervals of a few days to a month or longer. Invasion of the circulatory and lymphatic systems by the parasites is associated with severe T. b. rhodesiense will cause death within months whereas an untreated infection with T. b. gambiense will cause death after several years. Damage caused in the neurological phase is irreversible. There are two subspecies of the parasite that are responsible for initiating the disease in humans. Trypanosoma brucei gambiense causes the diseases in west and central Africa whereas, Trypanosoma brucei rhodesiense has a limited geographical range and is responsible for causing the disease in east and southern Africa. In addition, a third subspecies of the parasite known as Trypanosoma brucei brucei is responsible for affecting animals but not humans. Humans are the main reservoir for T. b. gambiense but this species can also be found in pigs and other animals. Wild game animals and cattle are the main reservoir of T. b. rhodesiense. These parasites primarily infect individuals in sub-Saharan Africa because that is where the vector (tsetse fly) is located. The two human forms of the disease also vary greatly in intensity. T. b. gambiense causes a chronic condition that can remain in a passive phase for months or years before symptoms emerge and the infection can last about 3 years before death occurs. T. b. rhodesiense is the acute form of the disease and death can occur within months since the symptoms emerge within weeks and it is more virulent and faster developing than T. b. gambiense. Furthermore, trypanosomes are surrounded by a coat that is composed of variant surface glycoproteins (VSG). These proteins act to protect the parasite from any lytic factors that are present in human plasma. The host’s immune system recognizes the glycoproteins present on the coat of the parasite leading to the production of different antibodies (IgM and IgG). These antibodies will then act to destroy the parasites that circulate around the blood. However, from the several parasites present in the plasma, a small number of them will experience changes in their surface coats resulting in the formation of new VSGs. Thus, the antibodies produced by the immune system will no longer recognize the parasite leading to proliferation until new antibodies are created to combat the novel VSGs. Eventually the immune system will no longer be able to fight off the parasite due to the constant changes in VSGs and infection will arise. Currently there are few medically related prevention options for African Trypanosomiasis (i.e. no vaccine exists for immunity). Although the risk of infection from a tsetse fly bite is minor (estimated at less than 0.1%), the use of insect repellants, wearing long-sleeved clothing, avoiding tsetse-dense areas, implementing bush clearance methods and wild game culling are the best options to avoid infection available for local residents of affected areas. At the 25th ISCTRC (International Scientific Council for Trypanosomiasis Research and Control) in Mombasa, Kenya, in October 1999, the idea of an African-wide initiative to control tsetse and trypanosomiasis populations was discussed. During the 36th summit of the African Union in Lome, Togo, in July 2000, a resolution was passed to form the Pan African Tsetse and Trypanosomiasis Eradication Campaign (PATTEC). The campaign works to eradicate the tsetse vector population levels and subsequently the protozoan disease, by use of insecticide-impregnated targets, fly traps, insecticide-treated cattle, ultra-low dose aerial/ground spraying (SAT) of tsetse resting sites and the sterile insect technique (SIT). The use of SIT in Zanzibar proved effective in eliminating the entire population of tsetse flies but was expensive and is relatively impractical to use in many of the endemic countries afflicted with African trypanosomiasis. For T. b. gambiense intravenous eflornithine or the combination of nifurtimox and eflornithine appear to be more effective and easier to give. These treatments may replace melarsoprol when available with the combination being first line. Intravenous melarsoprol was previously the standard treatment for second-stage (neurological phase) disease and is effective for both types. It is the only treatment for second stage T. b. rhodesiense however causes death in 5% of people who take it. Resistance to melarsoprol can occur. Belgian Congo by Louise Pearce of the Rockefeller Institute in 1920. It was used during the grand epidemic in West and Central Africa in millions of people and was the mainstay of therapy until the 1960s. American medical missionary Arthur Lewis Piper was active in using tryparsamide to treat sleeping sickness in the Belgian Congo in 1925. World Health Organization, signed a long-term agreement to manufacture and donate the drug. Using a genetically modified form of a bacteria that occurs naturally in the gut of the vectors is being studied as a method of controlling the disease. A trial in 2005 is testing the efficacy of the first potential oral treatment for sleeping sickness, pafuramidine. Trypanosomiasis vaccines are undergoing research. For current funding statistics, human African trypanosomiasis is grouped with kinetoplastid infections. Kinetoplastids refer to a group of flagellate protozoa. Kinetoplastid infections include African sleeping sickness, Chagas’ disease, and Leishmaniasis. All together, these three diseases accounted for 4.4 DALYs and an additional 70,075 recorded deaths yearly. For kinetoplastid infections, the total global research and development funding was approximately $136.3 million in 2012. Each of the three diseases, African sleeping sickness, Chagas’ disease, and Leishmaniasis each received approximately a third of the funding, which was about $36.8 million US dollars, $38.7 million US dollars, and $31.7 million US dollars, respectively. ^ WHO mortality and health data and statistics, accessed 10 February 2009. ^ Periodicals Archive Online accessed 15 October 2013. ^ a b , pp. 20–21.